Traditional coloured pencils are made of pigment bound in wax (sometimes with a little oil too) and encased in wood. Colours can be blended and applied lightly or boldly. 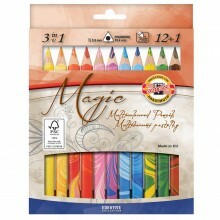 A great medium to use if you like to draw but you also enjoy working with colour. Available in Box of 6 & Box of 12.